Are you wondering about the use of hydrogen peroxide for dogs? Many pet owners may attempt to use hydrogen peroxide on their dogs, for everything from inducing vomiting to antiseptic purposes. If your dog is suffering, it’s natural to want to help him out straight away. This is especially true when they have eaten something they shouldn’t have, or appear to be in pain. But can hydrogen peroxide for dogs provide a useful at home remedy? Or is it better left on shelf? Can You Use Hydrogen Peroxide On Dogs? Hydrogen peroxide has traditionally been used by humans as a disinfectant and sterilizing agent. You likely have a bottle of it under your bathroom or kitchen sink. It’s a clear liquid used in the home and in clinical settings. It has long been thought to be a harmless, efficient way to clean and disinfect our homes. But when it comes to our bodies we obviously need to be much more careful. 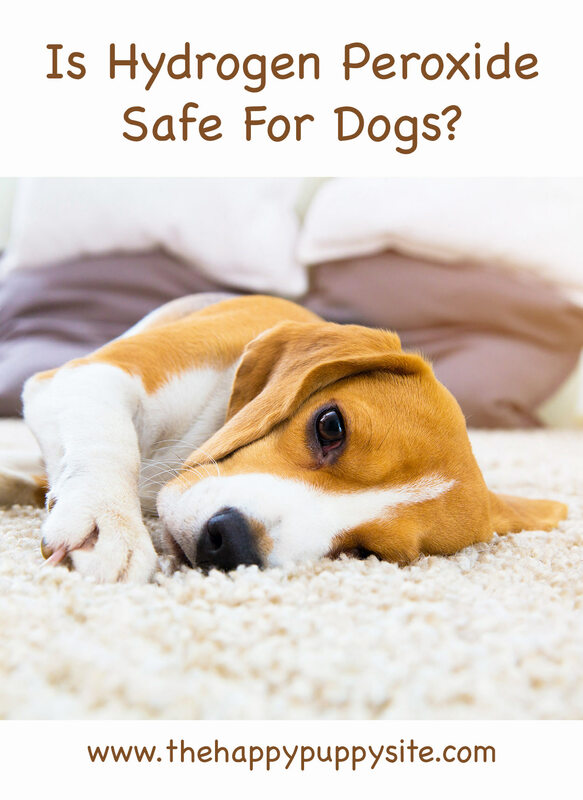 So, is hydrogen peroxide safe to use on our dogs too? And if so, for what purpose? Is Hydrogen Peroxide Safe For Dogs? Some studies have demonstrated that hydrogen peroxide, thought by some to be a harmless cleaning substance, has actually been the cause of human deaths when ingested. These tragic cases, however, were the result of improper administering of the substance. Persons harmed consumed too much or too high a concentration. In many cases, with various substances, toxicity depends significantly on the dose in question. When administering a substance to your dog, the dosage is just as important. My black Lab is a voracious eater of anything she can get her paws on. She’s notorious for quickly snatching anything that falls off the counter during meal prep. She has yet to gobble down something poisonous, but there are plenty of potential hazards that a dog might consume. Chocolate, avocado, and grapes are all foods that, if eaten in high quantities, can harm your pet. What happens if they find one of these toxic substances and eat it? Hydrogen peroxide can indeed be used to induce vomiting in dogs. It is an effective way to get a dog to throw up. However, one study published in 2012 points out that a dog’s stomach may not necessarily empty entirely when vomiting. You should also consider how long it’s been since your dog ate the potentially harmful material. Absorption rates vary, but chances are, if any significant time has passed, inducing vomiting may be a fruitless effort. There’s little evidence that backs up the claim that inducing vomiting (with or without hydrogen peroxide) is an effective way to save or help a poisoned animal. However, there are no studies that point to hydrogen peroxide being an unsafe way to encourage a dog to vomit. Various veterinarians still point to hydrogen peroxide as the first line of treatment in an emergency poisoning situation. That said, adverse effects are possible. The 2012 study in the Journal of the American Veterinary Medical Association found that out of 112 dogs, 16 experienced ill effects after using hydrogen peroxide to induce vomiting. The study points out, though, that the effects were not serious. Administering hydrogen peroxide during an urgent emergency is fine, but be wary of the dosage and concentration of what you have on hand. If you suspect your dog has ingested a harmful toxin, inducing vomiting is most effective within the first hour of ingestion. A quick response is vital, as is contacting your veterinarian. It’s not wise to administer a vomit inducing substance like hydrogen peroxide if your dog has already thrown up or is experiencing listlessness or a deteriorating condition. The reason? Accidental inhalation of hydrogen peroxide can cause more harm than good. To induce vomiting with hydrogen peroxide, it’s recommended that users do not exceed a hydrogen peroxide dose for dogs of anything more concentrated than a 3% solution. Administer up 2-5 milliliters per kilogram of weight. You should not give your dog more than 50 milliliters of hydrogen peroxide, however. Use a syringe or similar tool (e.g., a turkey baster) to administer the hydrogen peroxide safely. Vomiting should occur in about 15-20 minutes. If your pet throws up, visit the vet regardless. As previously mentioned, the stomach may not empty completely. Do not attempt to make your dog vomit a second time. And always, always call the vet. If the ingested item isn’t causing immediate distress, speak to them before inducing vomiting and make sure they don’t want you to bring your dog straight in instead. Can I Use Hydrogen Peroxide On My Dog’s Ears? 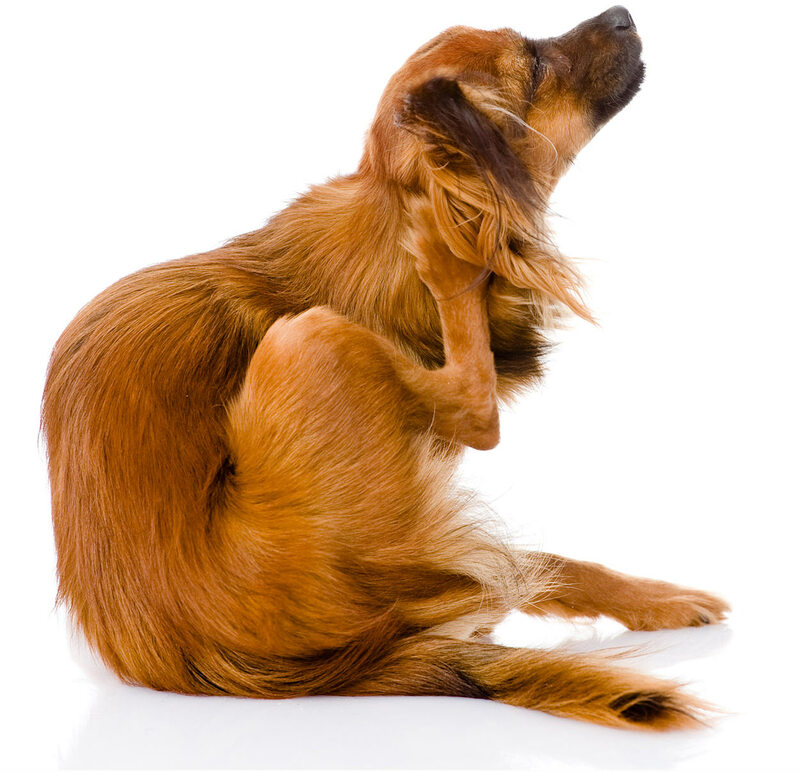 Has your dog been scratching her ears or rubbing her head? Do they look red or sore inside? Before you start working out how to clean dog ears with hydrogen peroxide from the bathroom shelf, please stop! Then take her to the vet instead. Don’t try to diagnose or treat the issue yourself at home. Without veterinary advice you can’t be sure of the cause of the issue, nor the best treatment. Hydrogen peroxide for dogs’ ears should not be considered, and here are some more good reasons why. Can You Put Hydrogen Peroxide In A Dog’s Ear? No! Cleaning dog ears with hydrogen peroxide is not a good idea. If you’ve ever tried to use hydrogen peroxide on your own ears, you’re likely aware that it’s a poor treatment option. If there are any open sores, they may burn when coming into contact with the liquid. One of my black Labs is unfortunately prone to allergies, which affect her ears. Her scratching sometimes results in cuts. Try to recall a moment when you cleaned a cut or scrape with rubbing alcohol or some other antiseptic. It sure does hurt! When hydrogen peroxide is used on an open wound, the result is painful and unpleasant, especially on tissue as sensitive as that in the ear canal. If you’ve ever suffered from chronic ear infections, you know that the worst thing you can do is promote a moist environment in the ear canal. Hydrogen peroxide, in effect, creates a haven for bacteria. Even if your dog doesn’t have an infection, to begin with, administering hydrogen peroxide can actually cause a problem rather than solve one. If your pup has issues with its ears, then visit the vet. Trying to treat the problem without knowing its root cause can actually make things worse. The same is true if you are considering using hydrogen peroxide for dog ear mites. Just see the vet instead. Can Hydrogen Peroxide Be Used On Dogs’ Wounds? A 1999 study in the European Journal of Clinical Pharmacology found that hydrogen peroxide was not a good antiseptic. The study’s goal was to look at the number of bacteria in human mouths after rinsing with common antiseptics, hydrogen peroxide included. The results showed that cleaning with hydrogen peroxide did not result in a decrease in mouth bacteria. It seemed I’d been led astray my whole life! I had always thought that hydrogen peroxide had earned a rightful place in my medicine cabinet. Hydrogen peroxide does indeed attack and kill bacteria. Unfortunately, it also gets rid of beneficial cells that help in the healing process. It’s not an effective antiseptic for this very reason. In fact, hydrogen peroxide actually slows the healing process. This is particularly problematic since dogs, unlike humans, tend to lick their wounds, disrupting the healing process already. Hydrogen peroxide compounds the problem. Not to mention the issue of licking off the stuff. Hydrogen peroxide is an emetic. This means it will cause your dog to vomit, which is unnecessary and potentially harmful if it’s not an emergency situation. In addition, if you use peroxide with a high concentration to clean a wound, it may be harmful if ingested by your pup. Some dogs produce excess tears, which stains the skin and hair surrounding the eyes. This build-up looks awful and without proper grooming can result in infection or discomfort for your dog. Regardless of its effectiveness, if you want to remove dog tear strains, hydrogen peroxide is not a safe option. You should not use it near or around the eye area as it can cause severe damage. Hydrogen Peroxide For Dogs – Should We Be Using It? There are a lot of potential uses for hydrogen peroxide for dogs, but only one of them should ever be considered by owners. And that’s to induce vomiting. Even then this should be carried out with extreme caution, and only in a dire emergency. Not only does overdosing have the potential to make your dog even more unwell, you won’t actually know that doing so at home will empty your dog’s stomach enough to solve the problem. Not to mention the possibility of harming your dog if you are inducing them to vomit something that could cause further damage on the way back up. In general, hydrogen peroxide and dogs don’t mix. 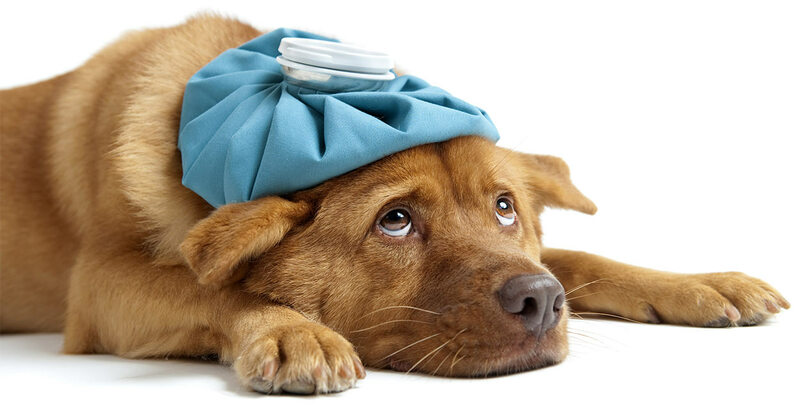 If your dog is unwell, the best thing to do is to phone or visit your veterinarian. These qualified experts are the best people to help your dog return to health. Do you have an experience to share? Let us know in the comments! Bates, N., Rawson-Harris, P. and Edwards, N., ‘Common questions in veterinary toxicology’, (J Small Anim Pract) 2015. Eddlestone, Susan M., DVM, DACVIM, ‘Drug Therapies Used in Gastrointestinal Disease’ 2002. Khan, Safdar A., DVM, PhD, DABVT, et al., ‘Effectiveness and adverse effects of the use of apomorphine and 3% hydrogen peroxide solution to induce emesis in dogs’ 2012. Luiz, Julie Ann, DVM, and Johanna Heseltine, DVM, MS , DACVIM, ‘Five Common Toxins Ingested by Dogs and Cats’, (Vetfolio) 2008. Nicholas, Jason, Dr. ‘Why Hydrogen Peroxide Is NOT For Cleaning Pet Wounds’. October 23, 2015. Pitten, FA. & Kramer, A. E J Clin , ‘Antimicrobial efficacy of antiseptic mouth rinse solutions’, (Pharmacol) 1999. Stephen et al. 1994. Hydrogen Peroxide: A source of lethal oxygen embolism case report and review of the literature. The American Journal of Forensix Medicine and Pathology.